More people died from gunshots than car accidents in Tennessee and 20 other states during 2014. Some advocates say that trend will spread nationwide in 2016. During the last decade, gun-related deaths — homicides, suicides and accidental shootings — have increased in Tennessee, while vehicle-related deaths — crashes and pedestrians struck by vehicles — have declined. Gun-related deaths in Tennessee rose from 865 in 2004 to 1,020 in 2014, according to the latest data available from the Centers for Disease Control and Prevention. In that same time period, vehicle-related deaths dropped from 1,191 in 2004 to 906 in 2014, according to the Tennessee Department of Safety and Homeland Security. Advocates for increased regulation of the gun industry point to those opposing trends as proof government regulation can make an industry safer without obliterating it. "When you look at the history of gun regulation and vehicle regulation, they could not be more different," said Ladd Everitt, director of communications at the Coalition to End Gun Violence. "Starting in the 1960s, the United States began to take a look at carnage that we were seeing on our roads and made a serious effort to strictly regulate drivers, cars and roads." He pointed to driver licensing and registration, driving tests, seat belts, speed limits, airbags and routine road patrols by police as ways the government regulates the manufacture and use of automobiles. And he argued such regulation made the roads safer. "We've done none of this for guns," he said. "Currently in the United States, over 90 percent of households own a car. Only 32 percent own a firearm. That the death totals between the two are close at all to me is remarkable, given how many Americans drive versus how many handle a gun." But Trentyn Murrell, a sales associate at The Shooter's Depot in Chattanooga, said there is a key difference between the auto and gun industries. 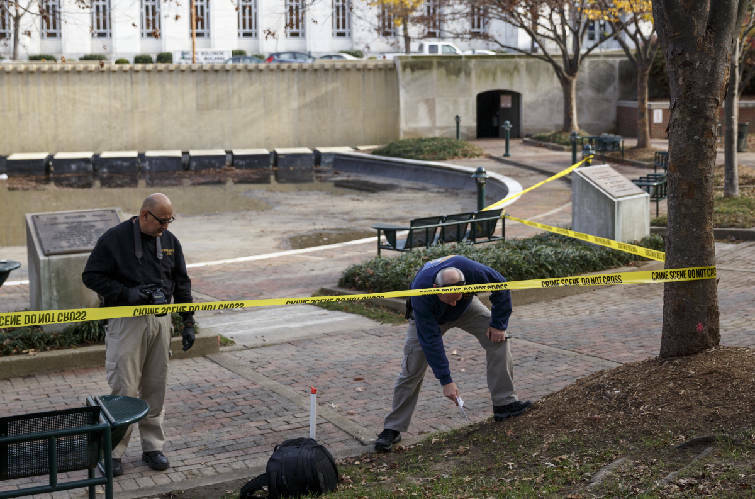 Investigators with the Crime Scene Unit work the scene of an early afternoon shooting in Miller Park on Tuesday, Nov. 24, 2015, in Chattanooga. Chattanooga Police said that around noon, an unnamed man was shot twice and taken to an area hospital in non-life-threatening condition, and a male suspect was taken into custody. "It is a privilege to be able to drive, but it is a right to be able to carry a firearm," he said. "Yes, crime is rising. But why? Don't look at just the cars or just the guns. Why is crime rising?" He pointed out that while most vehicle-related deaths are accidents, many gun-related death are driven by a specific motive — so imposing safety regulations on the tool used in the crime may not stem the death rate as effectively as regulations did for the auto industry. The National Rifle Association did not respond to a request for comment Friday. In Chattanooga, 35 people died in vehicle-related incidents during 2015, according to the Chattanooga Police Department., while 23 of the city's 30 homicide victims died from gunshots. The city saw 23 suicides in 2015, but police were not able to say Friday how many of those people used guns. According to data from the Centers for Disease Control and Prevention, suicides by gun accounted for about six of every 10 firearm deaths in 2010 nationwide. Statewide, the pace of gun-related and vehicle-related deaths has seesawed during recent years. But while vehicle-related deaths saw a large drop between 2004 and 2008, gun-related deaths have generally increased, with only occasional year-over-year declines. "Although gun deaths have dropped since the mid-90s, when there was basically a homicide epidemic, we do not see them declining [further], they're just staying essentially stagnant," said Kristen Rand, legislative director at the Violence Policy Center, which produced a study comparing gun and car deaths across the nation in 2014. The study found 21 states saw more gun-related deaths than vehicle-related deaths in 2014. In Georgia, 1,391 people died from gunshots while 1,289 died in vehicle-related incidents, according to the study. Rand said she would like to see the federal government create standards to regulate guns' trigger pull and size, as well as ban particular subsets of weapons, such as certain rifles "designed to increase lethality." As far as vehicle safety, government regulation has helped but needs to go further, said Cathy Chase, vice president of governmental affairs at the Advocates for Highway and Auto Safety. She'd like to see new safety features — like automatic brakes — become a required standard on new vehicles to drive road deaths down even more. "It is really time for them to take it to the next level," she said.